Rainwater diverters ensure a cleaner water supply by stopping the initial run-off of rainwater from entering your rainwater tank. This “first flush” of rainwater may contain debris, leaves or possibly chemicals and particles blowing through the air. Why Should You Install a Water Diverter? They provide fresher water and are a preventative measure against mosquitoes and their larvae entering your rainwater tank. Given this, many councils will recommend you install one, although they are generally not mandatory. A correctly installed water diverter will result in less debris finding its way into your rainwater tank, so you won’t need to clean inside your tank as much. “Sludge” normally accumulates inside your tank at the bottom which should be cleaned out every couple of years or so. There are also automatic tank self-cleaning devices to get rid of any sediment build-up once your tank is full. Nonetheless, having a diverter also prevents any air contaminants from industries, cars (if near a main road) or chemicals that may have blown in. Provides cleaner rainwater by preventing contaminants from entering your tank. Improves the quality of your rainwater to the lifetime of pumps and appliances. Very easy to install and requires little maintenance. Easy to setup a drip-feed irrigation systems into your garden. The water first passes through the built-in leaf filter which strains the water of larger particles then begins to fill the diverter body. 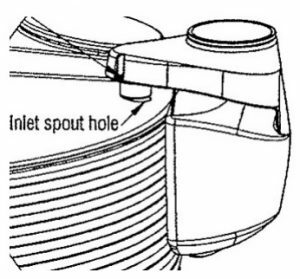 The diverter body has a hole at the bottom attached to a drain valve which when left partially open, allows the captured “first flush” of water to slowly empty. You can attach piping from the valve to use this water in your garden or direct it to your stormwater drain. Team Poly rotomould our own easy-to-install and eco-safe 60 litre water diverters. Unlike other rainwater diverters on the market, you don’t need to purchase additional piping separately. Everything is included in our special self-contained rainwater diverter units. If you need further information about a water diverter with your rainwater tank, contact our expert team today for advice.